“4 Essential Keys to Effective Communication in Love, Life, Work-Anywhere!” serves as a how-to-guide to help you overcome communication barriers. It shows you how to develop and practice the necessary listening, speaking, and dialogue skills to achieve success in your relationships, whether in love, life, or work. Includes the 12-Day Communication Challenge action guide for practicing a particular skill step each day. Chapter 13: NOW is the Time! 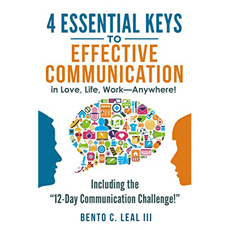 User Reviews of 4 Essential Keys to Effective Communication in Love, Life, Work--Anywhere!